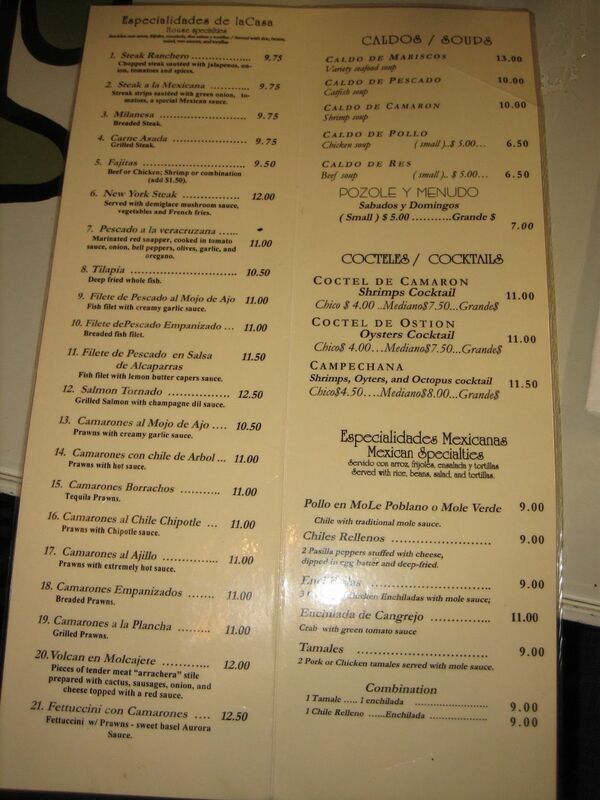 In search of a place to sit down and enjoy a long meal, we headed to El Delfin on 24th Street. The service was very homey and we were immediately given freshly fried tortilla chips. The two rounds of sangria were reported as excellent. We had the molcajete volcano as a starter then two types of shrimp, enchiladas and fajitas. The molcajete (mortar) volcano was bubbling red mortar full of spicy red sauce, fresh cheese, green onions, nopales, and beef accompanied by tortillas. The sauce was spicy and was supposed to be balanced by the cheese, but the cheese was a plain farm cheese which did not add or reveal any depth to the sauce. The nopales and meat were good wrapped in the tortillas, but overall the interesting presentation overshadowed the one dimensional taste of the red sauce. The restaurant offers several different preparations of shrimp. We chose the camarones de arbol chile and the camarones de chile chipotle. De arbol chile originated in Mexcico and is popoular in Western Mexican cooking. It tastes similar to it's cousin the cayenne pepper, but had more depth than cayenne. The pepper was cooked with a cream resulting in a creamy red-orange colored sauce. The shrimp were perfectly cooked and complimented by the spicy sauce. The camarones de chile chipotle was also excellent and had the bold flavor of chipotle chilis, milder and more smokey than the de arbol sauce. The enchiladas are a favorite of the one El Delfin regular at the table. He felt that the red enchilada sauce was more flavorful than the other places on Mission and would definitely order this dish again. Next time, the camarones de chili arbol and sample a dish that uses the enchilada sauce.